1// Bubba’s first Happy Meal! I don’t plan on promoting fast food but we were traveling, it kept him occupied, and it reminded me of childhood. 2// Our Thrift Store Christmas sweater finds… I am BEYOND excited for our Ugly Christmas Sweater Party next weekend! 4// Carmel Frappuccino; the only thing that helped me survive a 7 hour car ride to Ohio. 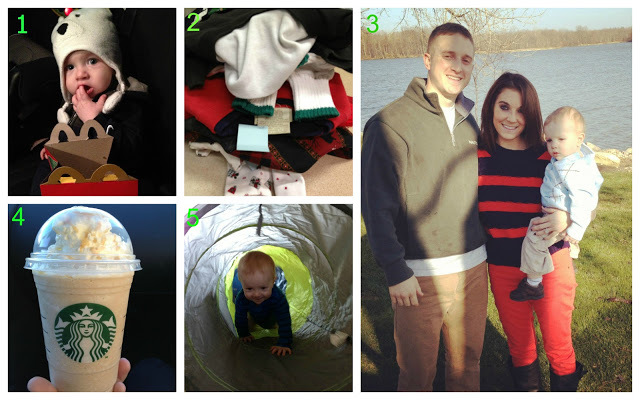 5// Bubba’s Black Friday surprise! I love his imagination… he’s the greatest. Hope everyone had a great Thanksgiving and continues to have a great weekend 🙂 Check back tomorrow for a great guest post!